With half an hour to go before the scheduled Facebook live broadcast, I message my guest to say good morning and confirm that we are good to go at 8AM. “I’m ready for you at 10,” he says. Then he calls, and with 30 minutes until the broadcast he explains his father has fallen drastically ill and he had the wrong time scheduled. Right now, he cannot make our 8 o’clock interview. He had to go to the hospital. LIFE HAPPENS! WHAT CAN I SAY? I’m sure I’m not the first mouse or man (or woman) whose best laid plans have gone awry. I had a plan, it was confirmed, and then it changed. It was completely understandable. A mistake mixed with a family crisis. But I was left with no-one to interview and a group that was waiting. This interview program was only a few weeks old. I had started it simply to add value to the Facebook group I created earlier this year. The program was called #tuesdaytactics to go with Tuesday’s hashtag theme in our Facebook Group, Personal Development in Business. My intention with these sessions was to promote key members of my group through the weekly Live Interviews in Facebook, and showcase their professional knowledge and expertise for the rest of our members. Through this I had hoped to increase engagement in the group which would hopefully create greater member connection, and growth. In the grand scheme of things, the plan was to continue to invest into the growth of a strong healthy group. I wanted to give my community genuine reasons to participate, with offerings that allow them to enjoy huge value every time they check in with us. People who belong to a group like this are much more likely to come along to our monthly events, and they might even connect with me further when they are ready to develop new systems for their own business growth. I am convinced you can give your way to business growth. When changes happen, we must happen right back. It would have been easy for me to pat myself on the back and tell myself I’d tried. I might have even thought I was a good person because I felt sorry for my guest whose dad was unwell. It’s amazing, the sorts of excuses we can hang our hat on. Yes, it was sad that he was sick, but that has nothing to do with the commitment I’d made. The best outcome could only occur if I saw it through. In one lightening fast moment I had gone from having a solid business building plan to facing failure, and I said NO! 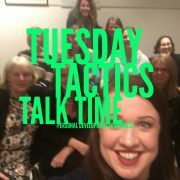 I scrolled (like the Dead Sea but faster) through my Facebook friends list, to find a new #tuesdaytactics Live Interview guest. My fingers were a blur across the keyboard as I typed fast. Copy message … Check the name is right. Read it back to make sure it suits the person. … and Send! Paste to a new friend. Paste again. Surely there would be someone online right now who would be up for a spontaneous promo interview? Not only did I find my dear, dear friend Andrea Dix to share her inspiring message from her new book Permission To Shine, but I also managed to book up five more Interviews that would see me through into next month. Andrea and I had a wonderful talk that morning and continued to chat for a while after the #tuesdaytactics Live Interview was done. I could have seen this moment in many ways. It could have been the moment I took to console my friend whose dad was sick, and in that moment I would have felt lovely about myself and written his sadness into my own identity story. It could have been the moment I let slide because it was too late to do anything now and I could just pick it up next week. It could have been the moment that I walked away from the plan altogether. It had only been running for a few weeks, so there really wasn’t much to lose. I am the captain of my ship and the maker of my opportunities. In that moment, I rallied my resources of time, social connections and technology to create a new outcome from the one that my circumstance proposed. HOW DO YOU USE WHAT YOU’VE GOT? Build a strong community of support by always giving more than you get. You never know when you will need to cash in those credits. Never give up. Never, never, never give up (Churchill was really onto something).